Some people (many of them poets) have an obsession with letters. Maybe they still have multi coloured letter cubes left over from their baby days. Maybe they have them flying on a lounge room wall instead of ducks. Maybe they are as obsessed with the alphabet as Arthur Stace was with Eternity. 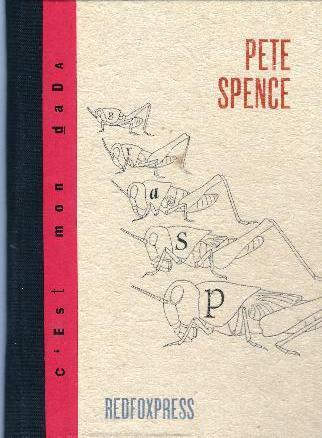 Pete Spence’s GRASP starts off representationally enough with an artist’s impression (concrete poet’s impression) of a grasshopper on the cover. It is a striking image and self explanatory. Once we move into the book the illustrative representational aspect is cast aside in favour of a more abstract expressionist investigation of letters. Most of these pieces have white or white outline letters against a solid black background. Are the letters standing for the light against the dark? Is Spence hinting that only through letters will we gain understanding of all that’s going on through the endless darkness? Is there a hint here of letters looking for companions to complete themselves and become words? Ian Hamilton Finlay remarked: Letters don’t like to live the solitary life. Perhaps these pieces ask those sorts of questions. For well over a century abstract art has provided meanings based on suggestions and hints. Who was it said – I don’t paint objects I paint pictures. Matisse? Cezanne? Concrete poetry of the kind composed here by Pete Spence is in that genre. It can be enjoyed for its abstract pattern as in the pleasant loops of the ch; or you can feel teased by the jigsaw conundrum of the A B C D and their torn off texture blocks; or teased by the scientific mumbo-jumbo of the third piece with its X and 7. Ian Hamilton Finlay also remarked: Language is a part of us but strange to us. Pete Spence explores and celebrates the strangeness of language. He hints at the mental processes and mechanisms by which we use letters to create languages to understand what is going on ‘out there’. In doing so he creates abstract patterns that have a startling, tantalising appeal. One can easily see many of his pieces as pre-creation – the letters looking for each other to enhance themselves and bring language and thought into being. They could also be seen as post-destruction. Language and harmony lie shattered; words and scientific formulae that were the basis of our civilisation splintered and thrown to the void. Any time devoted to slowly absorbing the patterns and suggestions in this book is time that will be well rewarded and remembered. GRASP is part of a series of now 101 A6 size books produced by RedfoxPress in Ireland. If you haven’t come across them yet do please look them up on the net. Should cost you about $30 each mailed to Australia. Erica Jong quote from Becoming Light Harper Collins 1992 p9; Ian Hamilton Finlay quotes from Selections Ian Hamilton Finlay University of California Press 2012 p 203 and p 210.